Having witnessed the devastating impact of losing art in a fire, Cyril Karaoglan has made it a lifelong mission to relay the message that insurance is a necessity for collectors, not a luxury, he tells Ahmad Minkara. When marking ‘not be missed’ art exhibitions on our calendars, it’s easy to forget that many of the masterpieces that we’re looking forward to seeing are being show through collaborative ventures with other institutions. These initiatives, which see galleries and museums borrowing and lending works amongst each other, are a win-win both for the institutions holding shows and visitors who are treated to a richer and more varied exhibition, perhaps providing once-in-a-lifetime opportunities to view works that would be out of reach in their usual home. The Louvre Abu Dhabi, which has showcased a significant number of renowned works by Picasso, Van Gogh and Da Vinci, for example, on loan from several French institutions, including the Musée du Louvre and the Centre Pompidou, is a prime example of a collaborative venture bringing some of the most famous artwork in existence to an entirely new audience. However, with so much excitement surrounding the works themselves, it’s easy to forget that these initiatives would be impossible, were it not for the key role played by the insurance industry, as Cyril Karaoglan, director at Nasco Insurance Group, knows only too well. Karaoglan has dedicated a large part of his life to convincing collectors that as a key asset, art must be insured to protect and preserve it. He explained that when he began selling Fine Art insurance policies in France in the early 1990s, many collectors believed that premiums were too high and that risks were limited. Born in Beirut, Karaoglan grew up in Paris, where he graduated with a degree in business. He did his training at Lloyd’s and joined Nasco, which was one of the top brokers, in 1991. There, he worked his way up by developing key niches, namely the Fine Art and Private Wealth insurance segments, providing services for clients looking to protect their art, jewelry and valuables, among other belongings. Today, he holds the position of director, leading the group’s operations across several markets in the Middle East, including Lebanon, the US and Europe. Time spent at Christie’s and Sotheby’s auctions in New York in an era when the art market was beginning to boom again fuelled his interest further. Today he has an impressive collection of his own, including pieces by Philippe de Crauzat, David Altmejd, Jean Michel Othoniel, Richard Prince, Bonalumi, Claude Lalanne, Hans Hartung and Daniel Arsham, which he often shares with his many followers on social media. Karaoglan is a firm believer that art is a great leveller and an ideal platform for dialogue, bringing people from all walks of life together and encouraging them to communicate. He is heavily involved in a broad range of art initiatives, supporting Musée d’Art Modern de la Ville de Paris, Dia Art Foundation and Opera Nationale de Paris, alongside APEAL and BEMA in Beirut. 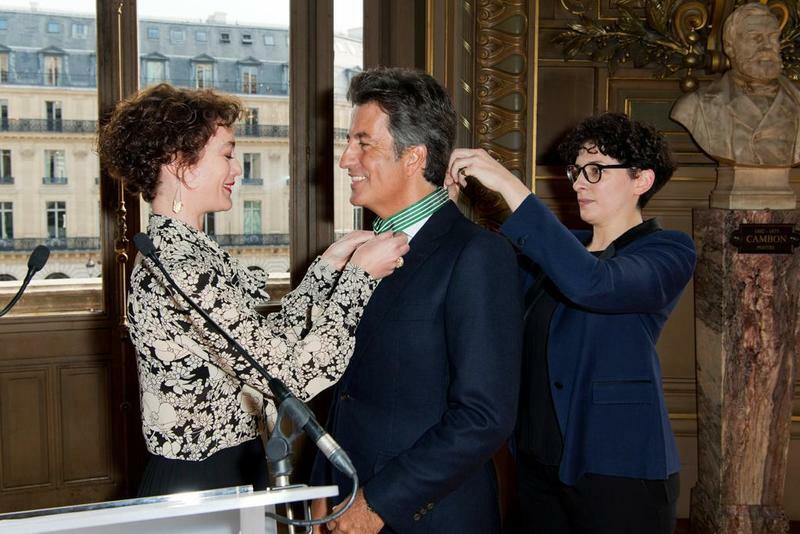 His passion for the arts has earned him the highest of accolades in France, namely the Medal of Commander of Arts and Letters, which he was awarded in 2016. Karaoglan is also president of the International Board for les Amis du Musée d’ Art Moderne et Contemporain de Paris, a member of the committee executive at the National Opera of Paris (Palais Garnier) and a member of the Board of Trustees of the Beirut Museum of Art. Asked whether he realistically expects the global art industry to retain the importance it has enjoyed in previous years, given today’s uncertain and challenging times, Karaoglan answered by recalling Winston Churchill’s reaction when, at the height of World War II, he was challenged to defend a budget that called for an increase in arts funding. “A Member of Parliament asked Churchill, ’How can you propose this at a time of extreme national crisis?’, to which Churchill replied, ‘I do it, sir, to remind us what we are fighting for’,” Karaoglan said.